Why Do You Need A Universal Programmer? SU-3280 Universal Gang Programmer is high speed gang programmer for engineering design and production purposes. It supports PC-based and Stand-alone programming modes and offers uniquely designed "X4" adapters allowing you to program up to 16 devices at the same time. SU-3280 Universal Gang Programmer is so far the most cost effective gang programmer on the market. Provides with DUT 75MHz bandwidth and < ±2.5nS signal skew. Provides stand-alone mode operation. With 5 keys and 20x4 LCD, you can select a project and easily start to program without PC. Portable and compact design, minimizing the working space and maximizing the efficiency. 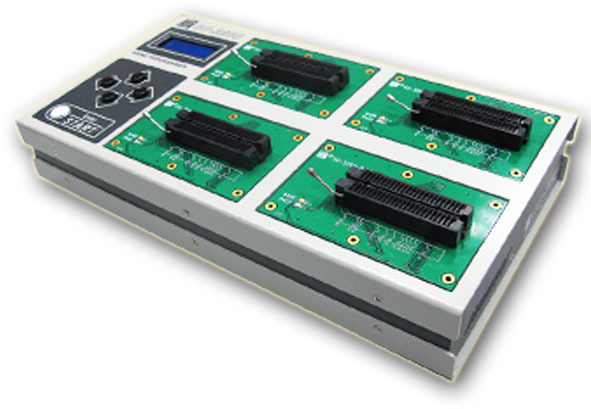 Provides IC insertion test and contact check before programming. In the AUTO mode, just insert the IC, and SU-3280 will start all the processes automatically. Provides high-expansion flexibility modular design. It can be used as single-site universal programmer or gang programmer. Provides mass-production-oriented software with full log info for best traceability.